Ökade träffningar i nordvästra Altis mellan AAF och FIA har tvingat rebellerna att omfördela sina styrkor, detta har lämnat byn Topolia underbemmanad. Enligt Rek från igår eftermiddag finns det enbart 20-25 FI inom staden utan något tyngre understöd. Joint-Command har bestämt att skicka en underbemannad kroatisk pluton understöd av en AAF tropp för att säkra byn. Nästa dag flera timmar försenade och med enbart 4 av AAFs tropp med sig anländer den kroatiska plutonen till sitt anfallsmål. Okänt till dem känner rebellerna till deras planer. Vi kan inte använda backkrönen, FI bevakar dem med Tksp och granatsprutor. Ytterligare information finns nedan på engelska. Enemy forces consist primarily of AAF deserters boosted by local militia. Majority of enemy forces are equiped with pre-civil war weaponry consisting primarily of 7.62 battle rifles and 5.56 light machine guns. 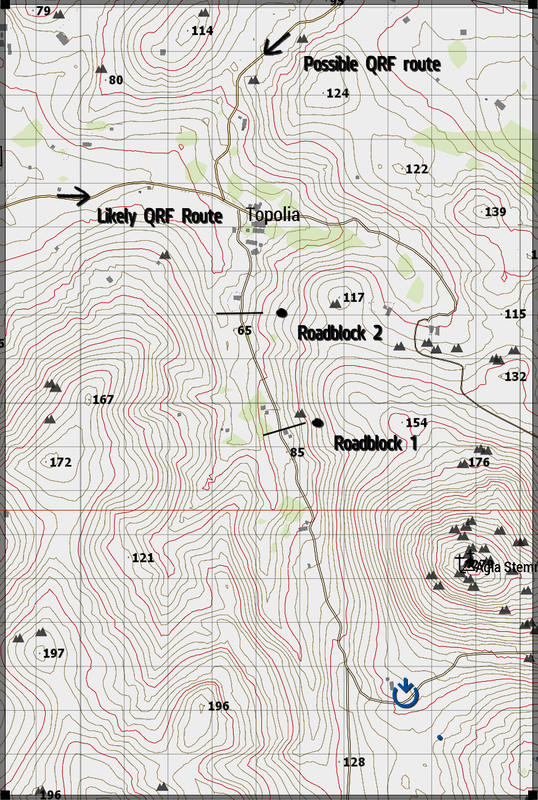 While no vehicles have been spotted in Topolia during reconnaissance the likelihood of a motorized QRF is deemed high. Recon has spotted one unmanned and one manned roadblock south of the town, here and here respectively. Recconnaissance suggests enemy numbers range between 20-25 men. We are one infantry platoon consisting of a HQ element, two rifle squads and one attached AAF MAT team currently located at the infiltration point. There are no other friendly forces within the ao and we expect no reinforcements. We are to clear the AO of hostile forces while taking and holding the town of Topolia. Assault the town of Topolia from the south, how this is done is left to the platoon commander. We can not use the surrounding hilltops as we risk exposing ourselves to FIA heavy weaponry. We have no friendly support or possibility to re-arm our forces. Wounded must be treated to the best of our abilities in the field. BLUFOR Victory is achieved when 90% of independent(FIA) forces have been destroyed. BLUFOR will be forced to retreat if they take 80% losses. Advanced ACE medical without advanced wounds and three minute revive-timer. Only Medics may use PAK, patient must be stable. Anyone can use epi-pens. The surrounding hilltops should not be used, there is nothing preventing you from using them but be aware you go against mission design. The AAF MAT Team does not have any shortrange radios only one long range, keep this in mind when relaying orders or attempting to contact them.